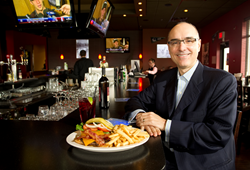 Mike Cordoba is the new CEO of rebranded Mr. Mike’s Steakhouse Casual and is growing the restaurant franchise opportunity quickly across western Canada with 25 locations scheduled to open in the next 3 - 5 years. Mike Cordoba is the new CEO of rebranded Mr. Mike’s Steakhouse Casual. Mike Cordoba grew up in North Vancouver and like many families they went to one particular restaurant for a weekly night out. They went to Mr. Mike’s Steakhouse as a weekly ritual, and Mike would enjoy a Mikeburger more often then not. Little did Mike know that 30 years later he would be the owner and CEO of Mr. Mike’s Steakhouse Casual. Cordoba is a chartered accountant and has over 20 years of diverse business experience, including managing a portfolio of public and private companies with $1 billion in total revenue in various industries including restaurants, retail, manufacturing and processing and real estate. He has built companies from the ground up to become industry leaders in their segments. Mike Cordoba is the new CEO of rebranded Mr. Mike’s Steakhouse Casual. In 2009 he co-founded Empresario Capital Partners, which acquires and/or invests in mid-market businesses that are successful in their own right but can benefit from a capital infusion together with a systematic approach to growth and profitability. Currently, Empresario has investment holdings in the food service and retail automotive industries. They bought Mr. Mike’s Steakhouse in 2010. Cordoba saw the vision of modernizing Mr. Mike’s but really keeping the roots with it’s relaxed atmosphere, unlike other Steakhouses. “We are the un-steakhouse.” Cordoba states. “We are unpretentious. We wanted to bring Mr. Mike’s into 2014 but not lose the casual feel.” By coupling their stress-free atmosphere and friendly staff and great steaks, they have created a fun casual dining experience. They have made many changes to the business to accomplish this: including a rebrand, created a new prototype; new look and feel of the restaurant inside, new signage for outside, new picture packages, updated their menu, and created branded beer and wine. Mr. Mike’s currently operates with 23 restaurant franchise locations and 6 franchise partners. Their restaurant franchise opportunity is certainly turning many heads as there are already another 25 locations scheduled to open in the next 3 – 5 years throughout BC, Alberta, Saskatchewan, and Manitoba. “Finding the right locations is key”, says Cordoba. They have focused on advertising their franchise opportunities to under serviced areas like Prince George, Kitimat, and Bonnyville to name a few.